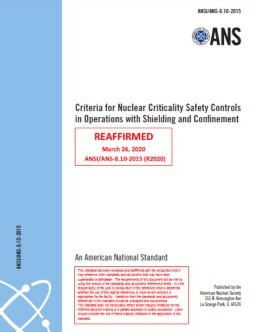 This standard is applicable to operations with plutonium-uranium oxide fuel mixtures outside nuclear reactors, except the assembly of these materials under controlled conditions, such as in critical experiments. Basic criteria are presented for plutonium-uranium fuel mixtures in single units of simple shape containing no more than 30 wt% plutonium combined with uranium containing no more than 0.71 wt% 235U. The limits for uniform aqueous mixtures (solution) are applicable to homogeneous mixtures and slurries in which the particles constituting the mixture are uniformly distributed and have a diameter no larger than 127 mm (0.005 in. ), i.e., are capable of being passed through 120 mesh screen. This standard does not include the details of administrative controls, the design of processes or equipment, the description of instrumentation for process control, or detailed criteria to be met in transporting fissionable materials.